Savor the food, flavor, rhythm, and romance of the Caribbean. 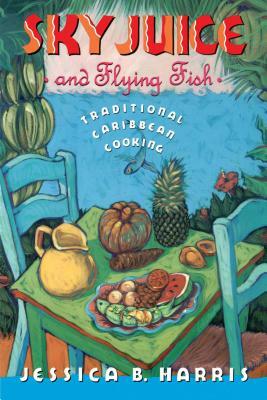 A truly authentic guide to down-home traditional Caribbean cooking, the kind you'd find at roadside stands, Sky Juice and Flying Fish captures the feel of the Islands, bringing the blue-green sea, the tropical breeze, and the exotic scents of the Caribbean into the American kitchen. A culinary history of each of the Islands provides the perfect introduction to the 150 mouth-watering recipes for appetizers and soups, entrees, side dishes, and desserts, all featuring the distinctly exotic seasonings -- ginger, garlic, chili, coconut, curries, and rum -- of the Caribbean. Begin your meal with plantain chips and a rum-spiked 'ti-punch. Go on to Bajan Fried Chicken from Barbados, complemented by a banana-ginger chutney and served with Jamaican Rice and Peas. Finish up with a sumptuous coconut pudding. A glossary lists ingredients from achiote (small reddish berries) to z'yeux noirs (black-eyed peas), which can be found in grocery stores, Caribbean markets, or through the mail-order source list provided in the appendix. Jessica B. Harris holds a PhD from NYU, teaches English at Queens College, and lectures internationally. The author of the memoir My Soul Looks Back as well as twelve cookbooks, her articles have appeared in Vogue, Food & Wine, Essence, and The New Yorker, among other publications; she has made numerous television and radio appearances and has been profiled in The New York Times. Considered one of the preeminent scholars of the food of the African Diaspora, Harris has been inducted into the James Beard Who’s Who in Food and Beverage in America, received an honorary doctorate from Johnson & Wales University and recently helped the Smithsonian Museum of African American History and Culture to conceptualize its cafeteria.